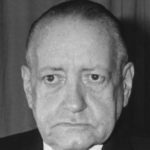 Alejo Carpentier was a Cuban novelist, essayist, and musicologist who greatly influenced Latin American literature during its famous “boom” period. Born in Lausanne, Switzerland, Carpentier grew up in Havana, Cuba, and despite his European birthplace, he strongly self-identified as Cuban throughout his life. He traveled extensively, particularly in France, and to South America and Mexico, where he met prominent members of the Latin American cultural and artistic community. Carpentier took a keen interest in Latin American politics and often aligned himself with revolutionary movements, such as Fidel Castro’s Communist Revolution in Cuba in the mid-20th century. Carpentier was jailed and exiled for his leftist political philosophies. "Those who have always had faith in its final success can do no less than rejoice as if it was our own triumph after five years of daily struggle to impose Cuban music on the European continent."